Your Author: Staff Sgt. Alfred Moss– Yes, he looks like he knows a thing or two about physical training. One of the traditions of Oldtime strength training that we really like a lot are wall charts and posters. Not only do they look really great while hanging in the gym, they also allow for an easy way to follow along and get in a great workout. So, in keeping this tradition alive, one of the projects that we have been working on was to take a classic Indian Club training course which was written back in the early 1900s and reprint it. We didn’t just reprint it though, we created an entirely different format… turning it into something that not only looks great, but should also help your club swinging as well, you guessed it: an instructional wall chart. 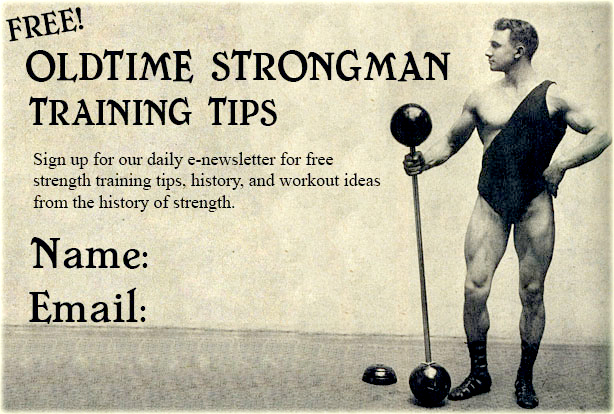 Written in 1905 by the famous strongman, gymnast and physical culturist Staff Sgt. Alfred Moss, “Simple Indian Club Exercsies” will take you step-by-step through the 12 basic Indian Club movements and includes additional suggestions on performance: technique, style, form and cadence etc. …All you have to do is follow along for a complete Indian Clubs workout. This poster is printed on high quality enamel paper but, in order to keep that classic look, we “aged” it digitally so that it looks like something that would be hanging in Sandow’s gym or Sig Klein’s place. can bet there would be one of these posters on the wall! The poster is 23 inches by 35 inches in size, comes folded, and looks great as you can see by the picture of it shown above. Think of it as a complete training course that you can hang on your wall instead of putting on your book shelf.